When The New York Times proclaimed 2012 to be “The Year of the MOOC,” companies large and small became intrigued with the potential of this learning approach and began experimenting with massive open online courses. This complimentary white paper, Microsoft’s Corporate MOOC: Transforming Sales Training by Sharon Vipond with Janet Clarey, describes how Microsoft designed and launched its first, highly successful massive open online course (MOOC) at a critical juncture in the company’s history. How Microsoft’s learning and development (L&D) leaders needed to quickly produce a high-quality, agile learning experience that supported the company’s global salestransformation and aligned with its new focus on cloud and mobile solutions. 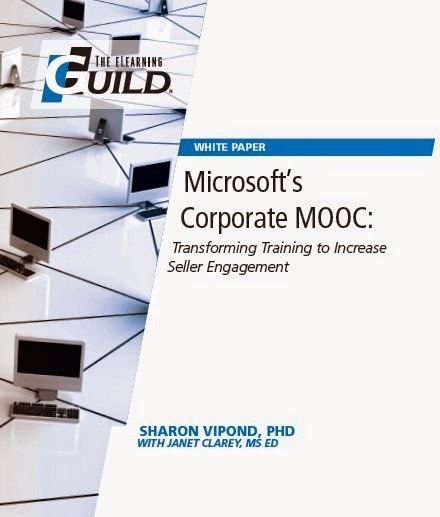 How worldwide staff in the Microsoft Center of Excellence selected a coursewaredesign partner, acquired a technology platform, and launched a highly successful MOOC for transformative sales training. How Microsoft built a strong content design partnership with INSEAD, an international leader in innovative business training and professional development. How Microsoft L&D leaders plan to move forward and capitalize on the experience and insights gained from their first worldwide MOOC deployment. The lessons learned and best practices gained from design and implementation of Microsoft’s sales training MOOC.